The December 2009 Newsletter has been posted. Links to photo galleries and additional information mentioned in articles in this newsletter can also be found at there, too. We need to get your RSVP with your choice of entrée no later than Monday December 7. RSVP to hq@sierranevadaairstreams.org or call 775 972 5011. Check Zephyrs and find out what else is new on the website. Note: some folks will (may?) 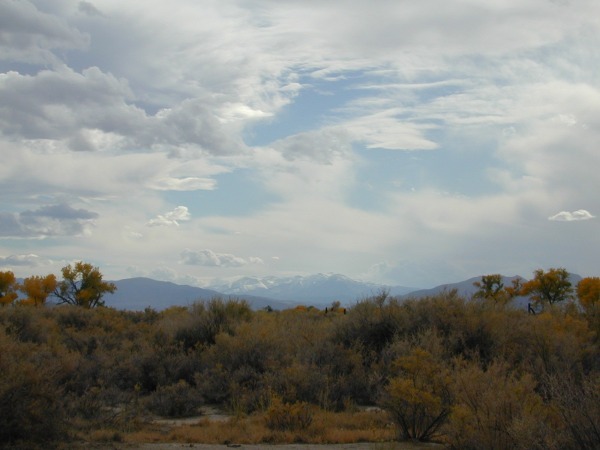 be doing Thanksgiving at Scout Camp on the Carson River (weather depending). Drop by if you’re out on the weekend! When you try to find out how an RV refrigerator works, it can get you to wondering how on earth somebody could invent it. RV Mobile has a good rundown on the process using ammonia, also known as refrigerant 717. The process occurs in a sealed pressurized set of tubes that has enough pressure in it to liquify ammonia at room temperatures. It has a hot side where ammonia is separated from water and a cool side where the ammonia gas is mixed with hydrogen to change its partial pressure and allow it to evaporate and provide cooling The hot and cold sides are separated by liquids with liquid ammonia in the condenser at the top and a water and ammonia solution in an absorber at the bottom. Three chemicals are needed for the refrigerator: ammonia, chosen because of the amount of heat it can carry and its boiling temperature; water, chosen because it will dissolve a lot of ammonia and be a liquid when ammonia is a gas; and hydrogen because it can take up space in a gas providing a partial pressure and won’t dissolve in either liquid ammonia or water. A key to how it works is Solubility of Ammonia – NH3 – in Water. Ammonia gas is readily dissolvable in water but how much is temperature dependent. Going from room temperature to body temperature water, the amount of ammonia that can be dissolved decreases by nearly half. That’s a range from about a pound to a half pound of ammonia in a quart so adding a bit of heat can release a good amount of ammonia. When heat is applied to an ammonia solution in the percolation (perc) tube, three things are happening at once. One is that ammonia gas is released as the solution with water heats up. A second is that water is separated out of the ammonia vapor. A third is a concentration of the ammonia in solution going up the tube. Ammonia gas comes out the top and any water that tries to escape with it is shaken out and sent back to the absorber tank. The heating that pushes gas out the top of the perc tube is also what drives the cycle. The condenser cools the ammonia gas which allows it to liquify. This is where the heat is removed from the refrigerator. Ammonia drips out of the condenser into the evaporator which has hydrogen trapped between the water below and the ammonia above. That gives the ammonia room to evaporate to share space with the hydrogen. This evaporation is what provides the cooling. As the ammonia drips on down the evaporator, more and more of it evaporates and that means its portion of the space shared with hydrogen increases. That means that the boiling point increases. So the higher part of the evaporator is used to cool the freezer compartment and the lower part is for the refrigerator. As the ammonia gas mixes with the hydrogen gas, it makes for a heavier mixed gas that settles down towards the absorber tank. That exposes it to water which dissolves the ammonia and leaves the hydrogen, which, being a light gas, rises back up to the evaporator. The whole thing depends upon heat rising and stuff sliding down tubes of various sizes to control the flow of the chemicals in a way to provide cooling. That is why the refrigerator in your RV needs to be fairly level to function efficiently. Fall color, snow clad mountains in the distance, sunsets, clouds, and pretty rocks, too. Pleasant weather (for the most part! ), good company, and no hassle getting the rigs level or finding a spot to park. The November 2009 Newsletter has been posted. Links to photo galleries and additional information mentioned in articles in this newsletter can also be found there, too. Plan on joining us Saturday November 14, 2009 at the historic Gold Hill, Hotel, near Virginia City. The Gold Hill Hotel is on Hwy 342 In Gold Hill just South of Virginia City. The hotel was established in 1859 and is touted as the oldest hotel in Nevada. Plan on joining us. The lunch starts at 11:30 am and the cost is $15 per person. Please RSVP to hq@sierranevadaairstreams.org or call 775 972 5011.